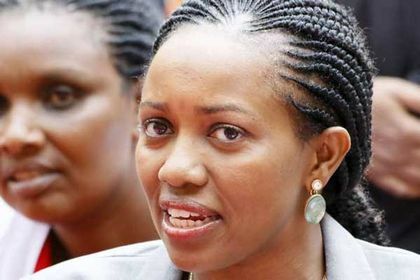 Monday April 15, 2019 - Nakuru Senator, Susan Kihika, has rubbished remarks by Central Organisation of Trade Union (COTU) Secretary General, Francis Atwoli, who said Deputy President William Ruto will not be in the ballot in 2022. Atwoli, who was speaking in a fundraiser in Lamu County on Saturday, promised radical constitutional changes, adding that Ruto's name will not feature in the ballot paper. He vowed to have the move implemented. “I assure you that after the next elections, Governor Ali Hassan Joho will be part of the next government. In 2022 we shall elect the president in an election that will be very peaceful since we shall have amended the Constitution,” Atwoli said. “The name of William Samoei Ruto will not be there (on the ballot)… You can take it to the bank,” Atwoli added. However commenting on Atwoli’s remarks Kihika said the COTU boss remarks could be a warning shot to the DP and an indication of possible assassination. In a tweet, Kihika revisited the death of George Muchai, who served as COTU chairman before being assassinated.